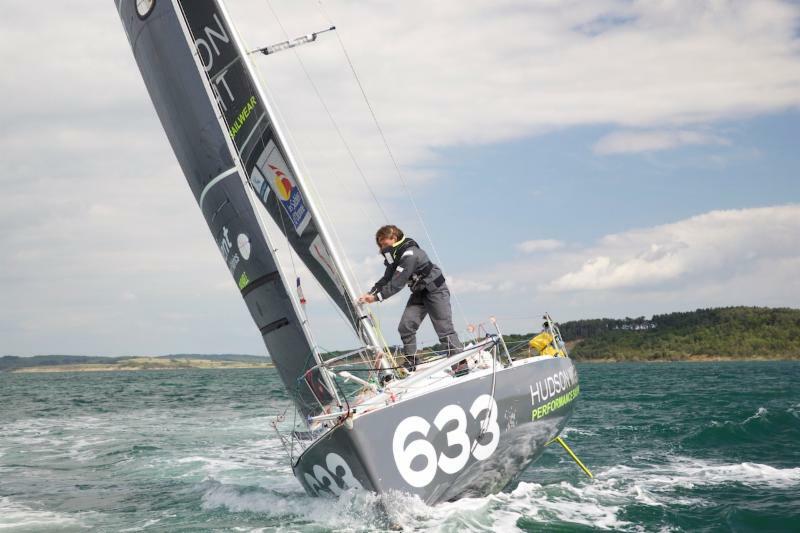 Peta Stuart-Hunt chats with the 25 year-old British solo sailor Lizzy Foreman before she sets sail on the final 2,770nm leg of the Mini Transat Iles de Guadeloupe to Guadeloupe on 31st October in 'Hudson Wight', Hull 633, a 10-year old Series Mini 6.50m. Lizzy is expecting to take around 20 days to reach Guadeloupe. The date by which all the competitors need to finish, in order to qualify for a place, is November 28th. Her flight to Paris is booked for 29th November, so she's feeling reasonably confident! PSH: Lizzy, you have already endured some very long days alone at sea during your first leg experience and now you will have been in Lanzarote for a month before setting of again on Saturday on Leg 2, a 20-day voyage of 2,770nm. How are you feeling? LF: The stopover has been long for sure and when I leave Lanzarote my priority is to crack the hardest tactical point of the race, getting into the trade winds - much of the overall result of this race is going to be aboutgetting in to these winds ASAP. The fleet will have to decide the best route to take leaving the Canary Islands (considering wind acceleration affects and the position of any low pressures), and then pick the best route around any low pressures we experience along the way. 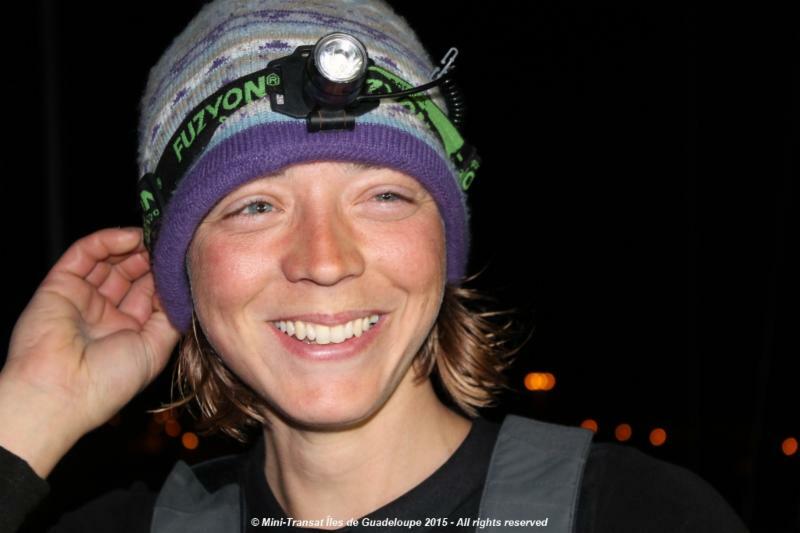 Her beaming smile lit up the darkness as Lizzy completed Leg 1 into Lanzarote. PSH: Did you learn anything especially useful about your boat and/or yourself during Leg 1? LF: I learned a lot. I could definitely have pushed the boat harder through better sleep and nutrition management, and I need to helm more, which can a bit boring sometimes when there is nothing on the horizon! I have learned to judge the limit of the boat better; it gets very reactive and it is knowing you have the confidence and ability to cope which allows you to hold a bigger sail for longer! The good bits were really great. Although the boat isn't comfortable the addition of a padded seat on the rail made a huge difference and prevented any backaches. I love small, cosy places. There isn't much space to sleep and I was often wedged in with my bags of food. My MP3 player broke and so did the boat's speaker, so luckily Mum has bought me a new player and I'll just listen to music on my headphones. This time I'm taking a book too. PSH: What's your biggest worry setting off on Saturday? LF: To be honest my worst nightmare is breaking something major like the mast or keel; but I'm most nervous about making a silly strategic error and finishing later than everybody else. The only upside being a good welcome on the pontoon! I'm really looking forward to getting going again. We've been here for a month and eventually you start to feel nervous and stressed about what's going to happen next. I need to get into those trade winds and let everything settle. "My existing waterproofs were an ageing set of Inshore kit and a heavy set of Ocean Kit, neither of which are particularly suitable for 2-handed offshore racing. HW 1 JacketI wore this a lot, mainly because it had a 'big jacket' feel but was incredibly light weight. The fleece lining and high collar gave good protection and warmth, but could easily fold down when not needed. I'm afraid the HW1 Jacket was so good, I didn't want to take it off to even try the Smock! I promise I'll feedback on this in due course. HW1 Trousers These kept me nice and dry which is the main thing that I look for! The fit is quite snug, something which I didn't like at first, but grew to find to be a good thing. I thought they might be a bit restrictive to movement, but this was not the case."